Good quality housing is about far more than just bricks and mortar. Living in a smart, comfortable home in a pleasant neighbourhood not only makes you feel good, but can improve health, job opportunities, crime levels, community spirit and overall personal happiness. When we plan a new development, we consider how it will impact on other amenities and how health services, employers, schools, transport links and utilities will be able to support those who live there. Sometimes this can lead to a new road, school or health centre being built, benefiting everyone in the area and acting as a stimulus for other improvements, too. The best results are achieved by people working together so we liaise with many others, such as the NHS, colleges, local authorities, campaigning organisations, land-owners, voluntary groups and village societies. We also support the endeavours of the Forest Economic Partnership to encourage business and investment in an area which is largely undiscovered, yet brimming with potential. Local housing associations – individually and through the Gloucestershire Homes and Communities Partnership. We debate issues of mutual interest, such as changes to the benefits system and helping our tenants to cope with debt. We also work with other organisations for mutual benefit, such as the NHS on initiatives to improve people’s health by recognising the strong link between quality housing, warmth, social activities and well-being. Cinderford Regeneration Board – 15 public and private sector organisations come together to deliver sustainable regeneration projects to benefit people who live in Cinderford and its surrounding district. 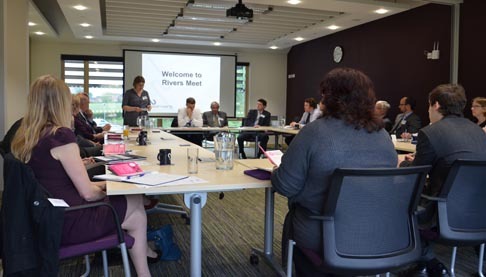 Forest of Dean District Council, Gloucester City Council, Stroud District Council, Cotswold District Council and Herefordshire Council – working with councillors and officers to plan and deliver housing that matches their residents’ needs. Central Housing Investment Consortia (CHIC) – a consortium of landlords using its combined buying power to procure construction, maintenance and repairs materials, services and labour. Two Rivers Housing saves tens of thousands of pounds every year through being a member of CHIC. PlaceShapers – a national alliance of more than 100 community-focused housing associations that come together to lobby Government and policy-makers for improvements in housing, neighbourhoods and associated improvements, such as employment, crime, health and education.